you little jerk look what you did you’re helpless you’re an idiot you’re what the French call “Les Incompetents” Kevin, you’re such a disease everyone in this family hates me then maybe you should ask santa for a new family I don’t want a new family, I don’t want any family! then say it again maybe it’ll happen I hope I never see any of you jerks again! I wish they would all just disappear I made my family disappear (I made my family) I made my family disappear (disappear) I made my family disappear Please tell Santy I just want them back this year A lovely cheese pizza just for me I’m going through all your stuff Buzz, you better come pound me! I’m watching rubbish, eating junk you better come out I can’t be a wimp, I’m the man of the house took a shower washing with actual soap in all my major crevices and in between my toes and in my bellybutton which I never did before but sort of enjoyed I’m not afraid anymore! can’t seem to find my toothbrush So I’ll pick one up today Other than that i’m in good shape <indeterminate screaming in English> KEVIN I made my family disappear please tell Santy I just want them back this year Merry Christmas, little fella we know that you’re in there be a good little fella now and open the door <indeterminate gasping in English> you guys give up, or are you thirsty for more? Harry, I’m coming in! why the hell’d you take your shoes off? why the hell’re you dressed like a chicken? 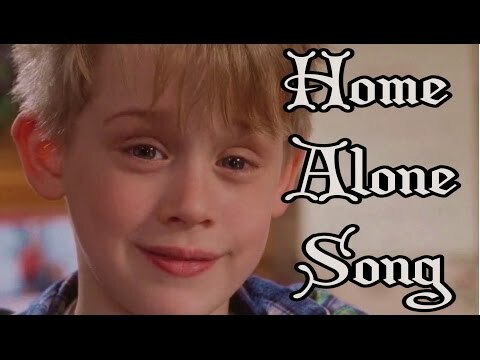 Ooh, you’re missing some teeth WHERE ARE YOU YOU LITTLE CREEP yeah hi, I have a song who’s HOME ALONE no please don’t hang up, don’t hang up the phone Friday, that’s two days away I’m not leaving here unless it’s on an airplane This is Christmas, seasons of perpetual hope! If it costs me everything I own I am going to get home even Uncle Frank and Buzz and Buzz’s girlfriend WOOF Buzz’s girlfriend WOOF k there’s a lot of things going around about me but none of it’s true k? Happy Holidays to you Here’s the track and other goodies too and a preview of more songs to come and more Home Alone music cuz we have an unhealthy obsessioooooooon SCHMOYOHO accent on the HO HO HO Happy Holidays to you!